Children’s Book Week is over for another year, but why not keep a good thing going? It’s never too early to read to kids – even the tiniest babies get something out of it. Here are nine things we’ve learned this week about the benefits of reading to babies and toddlers. “It’s bringing the story to life, so that’s part of learning that this is how you interact,” says Ms Connor. Books spark conversations about characters and their problems – and how these might relate to the child or family. For example, books featuring characters who are potty training or learning to live without dummies can be very reassuring for children going through those milestones in real life. “Choose books that relate to their world. Until the age of about four, children aren’t very good at discerning what’s real,” Ms Connor says. “Research suggests that listening to a story builds capacity to pay attention. Children are having quiet time, not jumping around, they are sitting still and listening, and enjoying that. That’s what schools expect children to do later on,” says Ms Connor. This might sound like common sense, but Associate Prof McArthur says this is an important step. “Even the idea that a books exists and it contains this thing called words, and words are composed of letters, and you hold the book the right way up, and you actually read from left to right – when they come to school, they already understand the concept of books and words and letters. If you imagine a child who’s never seen a book before, you can imagine how weird the whole thing would seem. If you need some ideas for children’s books, check out our post on this year’s Book of the Year winners. 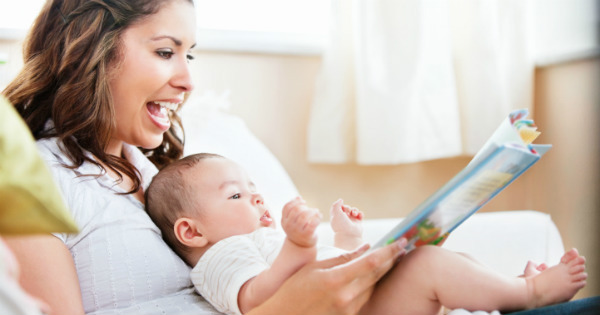 Do you read to your baby or toddler? What’s your family’s favourite book?